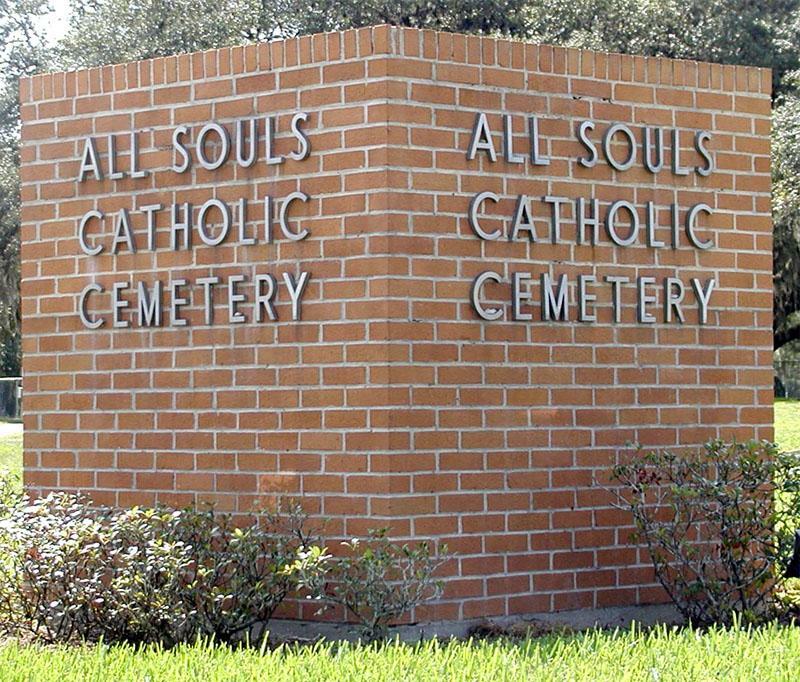 The indenture for the purchase of the property on which All Souls Catholic Cemetery stands was signed by the Right Reverend John Moore, D.D., Catholic Bishop of St. Augustine and a representative of the Florida Land and Colonization Company Limited, on December 21, 1889. 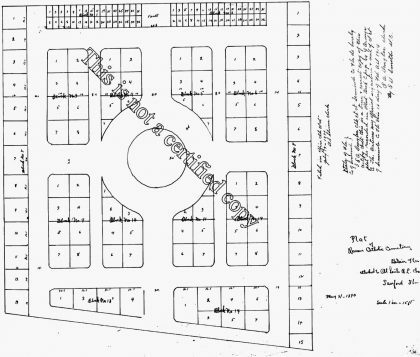 The 4 and 1/2 acres of land purchased for the Roman Catholic Cemetery and the parcel purchased in 1883 by the Sanford Cemetery Company encompass lands that were part of Henry Sanford’s original property which he named “Belair.” This is born out on the location inscribed on the plat for the property dated May 31, 1890. 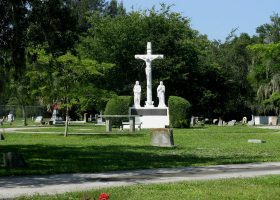 The “Plat of Roman Catholic Cemetery, Belair, Fla., attached to All Souls R. C. Church, Sanford, Fla. May 31, 1890” was filed in the office of the Clerk of the Circuit Court of Orange County on July 9, 1890 (Sanford was part of Orange County until Seminole County was formed on April 25, 1913). 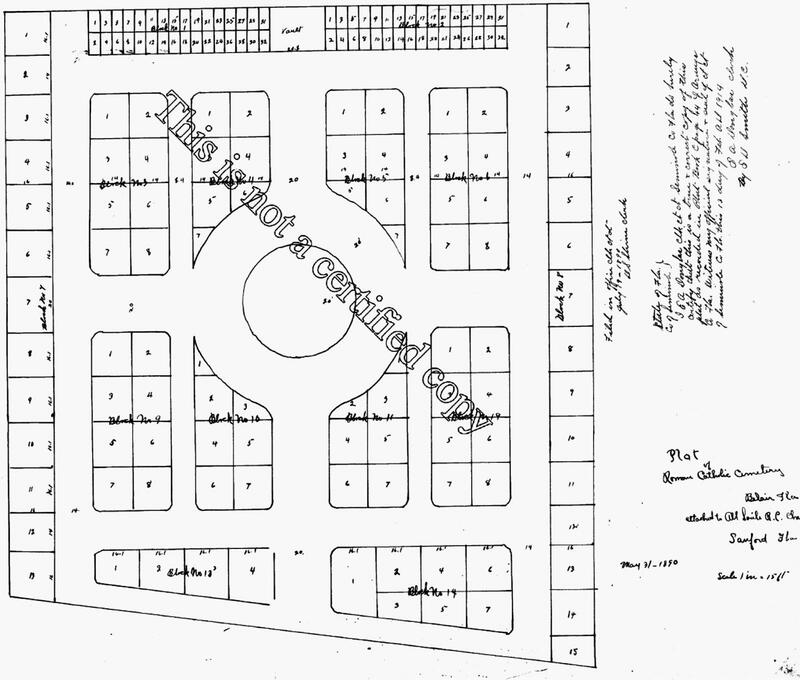 The same plat was certified by the new Seminole County Clerk of Court on February 13, 1914 (copy below). Look under IMAGES for full size image. A letter from Father John A. Hennessy, Pastor of All Souls, dated February 29, 1924 and a receipt from 1921 indicate the cemetery was once referred to as St. Callistus’ Catholic Cemetery, however, this name does not appear in local history books or directories or in the files at the Diocesan Offices in St. Augustine and Orlando. 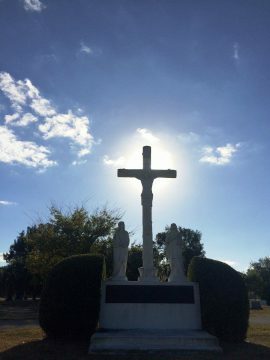 This tradition continues today, with the Pastor announcing the name of every parishioner who died during the year and a family member or another member of the parish placing a candle in front of the Calvary group monument for each of the departed. 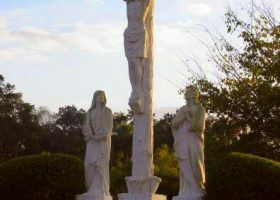 The Calvary monument(above)erected at the cemetery in October 1966, has a base five feet above ground and the 12-foot high cross. 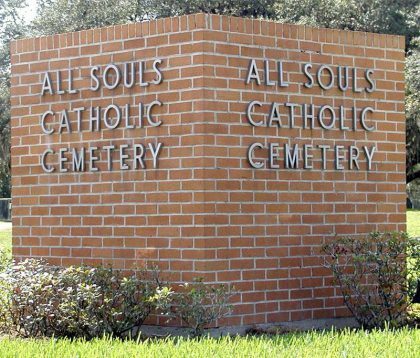 At that time and still today, All Souls Catholic Cemetery was the only Catholic Cemetery in the Diocese, although a new Catholic Cemetery in Central Florida is in the planning stages at this writing. 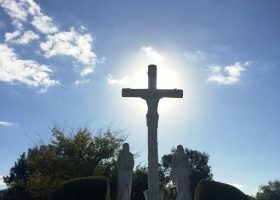 In August 1987, Father Lyle Danen, Parochial Administrator, announced that all cemetery business would be handled by Mr. Ross Barrows, replacing Mrs. Pat Tolle who had been handling cemetery business for several years. He also announced plans to improve the appearance of the cemetery. In October, the Men’s Club planted trees at the cemetery as part of the improvement plans. In January 1988 a fence was installed. In February the Men’s Club members and other volunteers worked all day cleaning up the cemetery grounds. 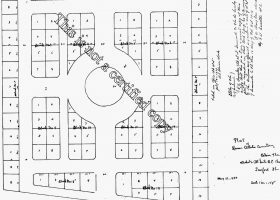 The few remaining lots in the old section at that time were only $350 each. 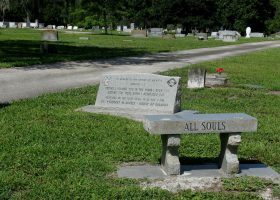 In June 1988, Tom Otto was appointed Director of All Souls Cemetery. On July 1st, the cost of cemetery plots was increased to $550 ($500 for the plot plus $50 for perpetual care) and cremation spaces were $250 ($200 plus $50 for perpetual care). In January 1989 Phillip Beasley took over as Cemetery Director. In September the Men’s Club once again sponsored a work day at the cemetery to get it in shape as it was too much for the church grounds keeper to manage by himself. 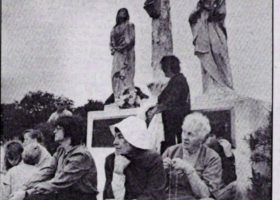 In May 1990, parishioner Dr. William Runge suggested that a special Memorial Day Mass be celebrated at the Cemetery the Sunday evening before the holiday. 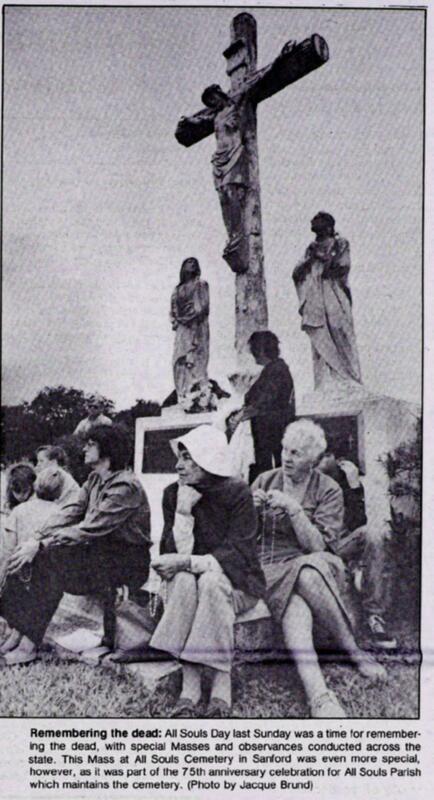 Father Burns commented on the event in the June 3, 1990 Sunday Bulletin: “A steady rain did not dampen the enthusiastic participation of the various branches of the military. At the conclusion of the Prayer of the Faithful, there was a moment of silence, followed by a gun salute and the playing of taps…” The Memorial Day Mass was repeated the following year with much better weather. In March 1997, Father Trout announced more improvements: “We are ready to pave the roads at the cemetery. New flowers are constantly being planted, trees trimmed…” The Parish Council voted to raise the price of a cemetery plot from $1000 to $1200 effective April 1st, 1997. 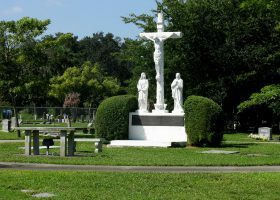 In April 2011, Mary Valente assumed responsibility for the cemetery and shortly thereafter, our insurance company gave notice that all ornamental items including any stone edging, rocks, etc. had to be removed from the gravesites. Since her appointment, a thorough survey of the cemetery was completed. Though issues with vandalism have been infrequent, in March 2013 thieves stole many of the copper and bronze vases affixed to some of the grave markers. 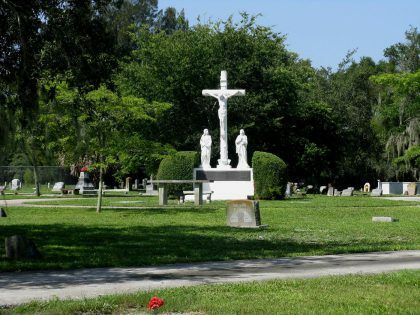 WESH-TV 2 interviewed Father Richard Voor at the cemetery on 25th street in Sanford who told the reporter that we pray for the thieves but hope God would touch their conscience and they would have a change of heart. The cemetery is a special place of rest for Catholic loved ones and peace for those they have left behind. The image below was taken by Anne Cammarata of All Souls Catholic Parish on All Souls Day, November 2, 2014. It was not retouched or adjusted in any way. The Calvery Monument installed and dedicated at All Souls Catholic Cemetery in October 1966. This list of Priest and Deacons who have served the parishioners of All Souls Catholic parish is a work in progress. As additional information and facts are discovered, the information contained in this list is updated. Indenture between Bishop John Moore and the Florida Land and Colonization Company, Limited, dated December 21, 1889 for the plot of land on which the All Souls Catholic Cemetery is located. 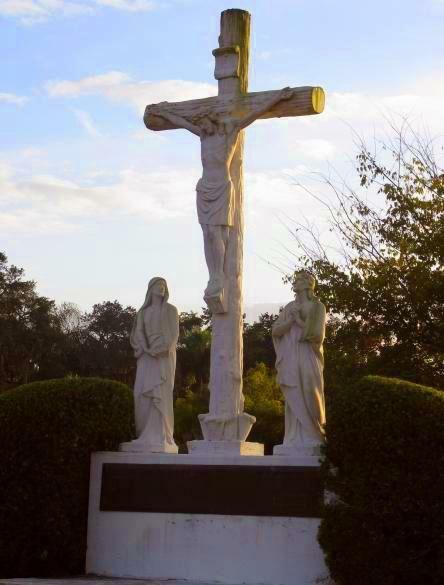 A 12-foot tall memorial entitled "Calvary" was installed at All Souls Cemetery in 1966. 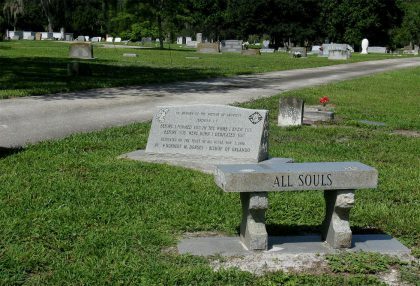 The "Plat of Roman Catholic Cemetery, Belair, Fla. attached to All Souls R. C. Church Sanford, Fla." was completed on May 31, 1890 and filed with the Clerk of the Circuit Court in Orange County on July 9, 1890. It was refiled and certified by the Clerk of the Circuit Court in Seminole County on February 13, 1914 after the formation of Seminole County in 1913. 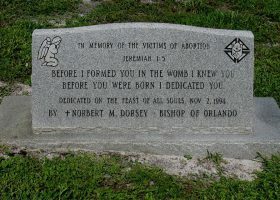 Articles published in the November 11, 1994 edition of the Florida Catholic on the dedication of a memorial marker for the "Victims of Abortion" located near the entrance of the All Souls Catholic Cemetery in Sanford, Florida on 25th Street near 17-92. 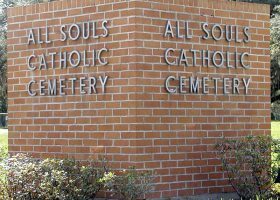 The marker was sponsored by the Knights of Columbus and dedicated on All Souls Day, November 2, 1994, by Bishopn Norbert M. Dorsey, CP. In March 2013, metal thieves vandalized graves at All Souls Catholic Cemetery, stealing brass and bronze flower vases. 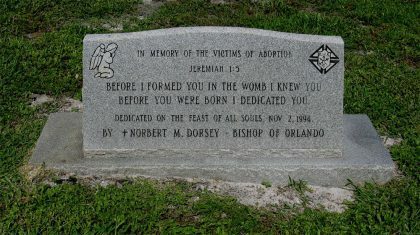 WESH-TV Channel 2 News reported the thefts and interviewed then pastor, Father Richard Voor at the cemetery.